An experienced sailor, Black was born in Englewood, New Jersey, in 1956 but has lived in Rhode Island since 1993. 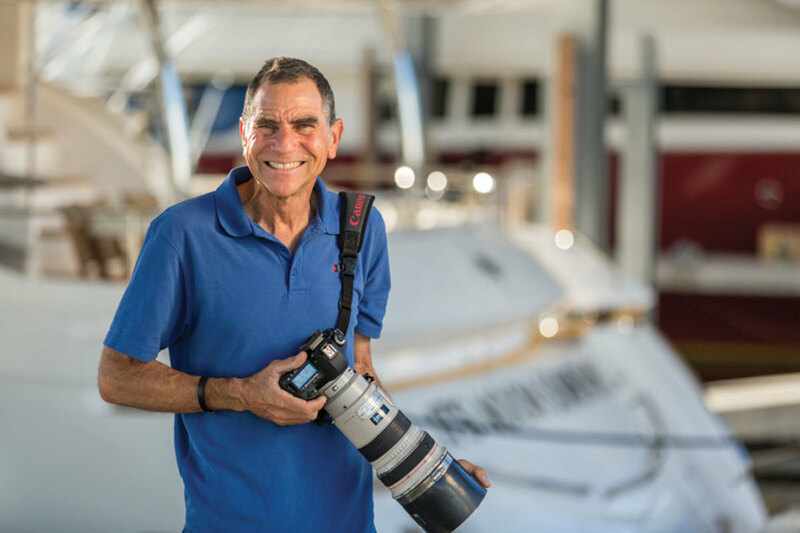 He’s been a marine photographer for 35 years. 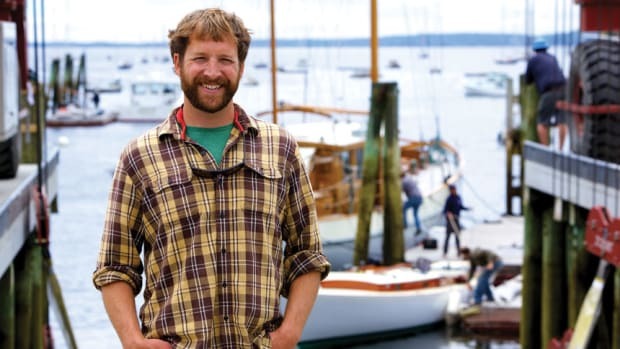 Industry insiders also know that he’s just one half of the Billy Black — Photographer For Sail business. 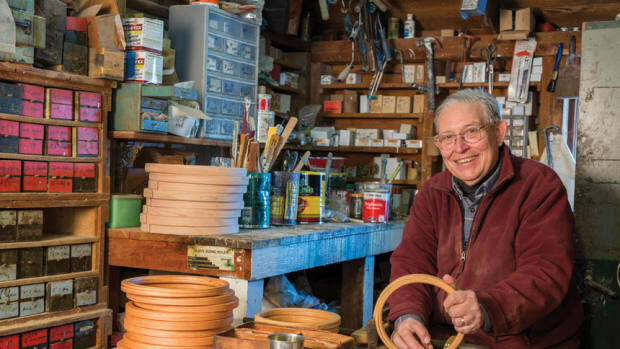 His wife, Joyce, keeps the home fires burning while Black is on the road for months each year, and she manages the back end of the business, handling the photo editing, archiving, billing and shoot logistics. 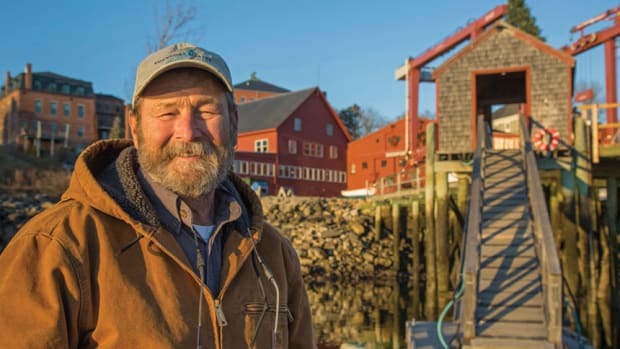 The entire marine industry heaved a collective sigh of relief when Black recently battled a rare form of cancer and bounced right back. It makes seeing his smiling face on the docks all the sweeter. 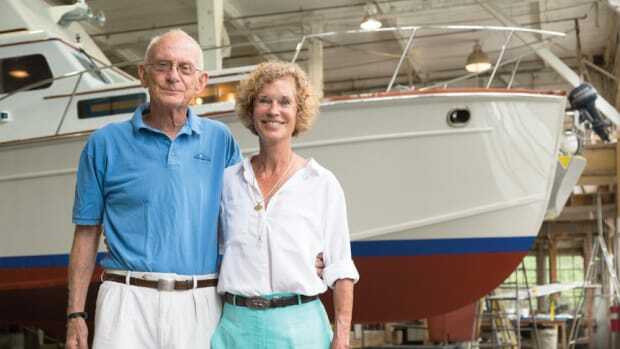 First memory of being on a boat: My father, Hank, built a mahogany runabout when he was in the Navy and named it CarWill after me and my sister Caryn. We had a cabin on Copake Lake in upstate New York where we went for a couple weeks each summer. My father was a great water skier, and I remember speeding around the lake with him and my mother, Gloria, when I was 5 or 6. We were all always smiling. First boat you owned: In 1979 Hank and I went together to buy a flush-deck Ericson 39 that turned out to need a lot of work. We only had one summer on the boat before he died, but I felt it was a legacy I needed to protect, and that work became a character challenge for me. Last or current boat: Joyce and I own a 1997 Glacier Bay 22 called We’re Here — it’s our photo boat. We tow it all over the Eastern Seaboard, and it’s given me a lot of freedom and independence to arrive for assignments ready for anything. Exciting photography often happens when it’s uncomfortable to be on a small powerboat, but I’ve always felt safe on the Glacier Bay. The name We’re Here is important to us since what I do is a team effort. I’ve had the great luck over the last 20 years to work with strong, capable women, and we’ve spent long days offshore doing photography. None of them were experienced powerboaters when they came to work with us, but they’ve all left feeling comfortable driving, navigating, and launching and retrieving We’re Here. Favorite boat you’ve owned: We’re Here. 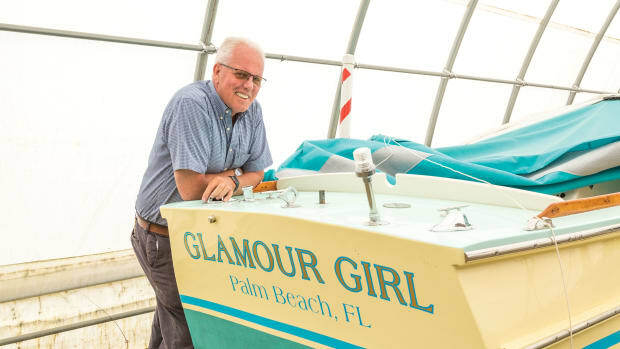 Your dream boat: Joyce and I have talked for years about getting a capable lobster yacht to go cruising, but you have to have the time to go slow. A more practical dream boat would be a 26-foot power catamaran with twin 250s to replace We’re Here. Most rewarding sailing experience: We don’t get to do lots of sailing since we’re usually chasing folks in the powerboat, but in 2005 I got to crew on board the 116-foot sailboat Whisper in a trans-Atlantic race. We had an amazing professional crew, and the best part was spending time with my watch mates, Ted Hood Jr., Richard Archer and Hugh Piggin. You share stories and challenges and get to know each other very well. Scariest adventure aboard: When I was learning to sail, back in the early ’80s, I signed up for a delivery from City Island, New York, to Florida on a custom Sparkman & Stephens ketch named Chi Chi. 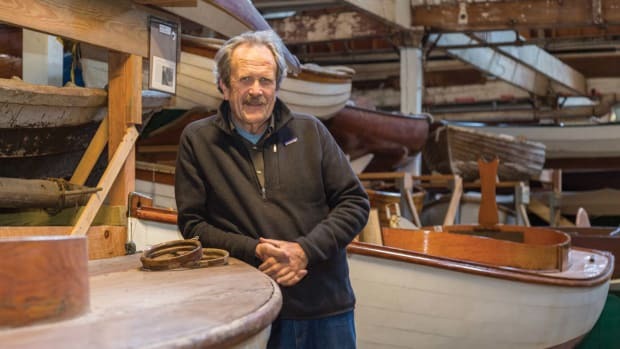 We left in a big nor’easter with a pretty good crew, but the more experienced sailors jumped ship in Norfolk, Virginia, because they didn’t like the owner, an elderly gentleman who refused to wait out the storm. We left Norfolk with just him, me and another young man, and when we were off Georgia, the owner had a heart attack and died. We called the Coast Guard, who asked some very uncomfortable questions like, “What color is he?” but they finally came out and towed us into the Skull Creek Marina. Most memorable experience aboard: I’ve always been inspired by the single-handed sailing community and had the good luck to work with America’s premiere solo sailor, Mike Plant. In 1992 I was part of the crew that helped deliver his Open 60, Coyote, to Annapolis, Maryland, for the boat show in October. 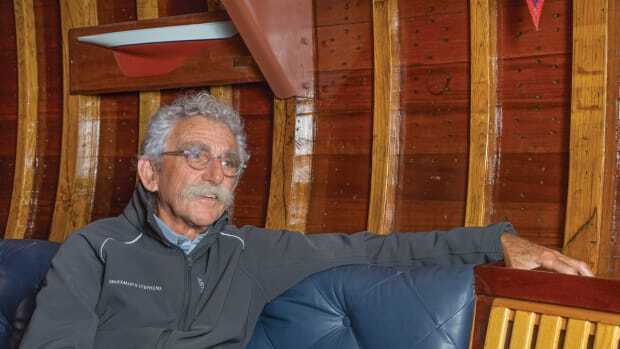 He had built the boat for the Vendée Globe race, nonstop around the world, and he should have been sea-trialing the boat and heading to France for the start, but he needed money. We were early and decided to do some rig tuning when Coyote ran aground with me at the helm. Everyone was looking at the rig instead of the chart. Running aground in the Chesapeake is nothing too surprising for a boat that probably drew 16 feet, but it was haunting because the keel fell off when he was sailing to France, and Plant was lost. Was the grounding the reason? Was it something else? We’ll never know. Longest time you’ve spent at sea without setting foot on land: The trans-Atlantic passage on Whisper. Favorite destination so far: For me being on the water just feels natural, and it’s more about that experience than any destination. I love taking challenging conditions, making the most of them safely and coming away with powerful images. Just being offshore in my little boat, feeling the forces of nature and working with them, is very satisfying. Favorite nautical book: I’m not much of a reader but I just finished Mary South’s The Cure for Anything Is Salt Water and really enjoyed it! Favorite nautical cause you support and why: My beautiful mother, Gloria, had a cerebral accident when she was 42 years old and ended up paralyzed on her right side. She still wanted to be involved in everything I was doing, and we both found help and inspiration in Harry Horgan’s organization Shake-A-Leg (shakealegmiami.org). 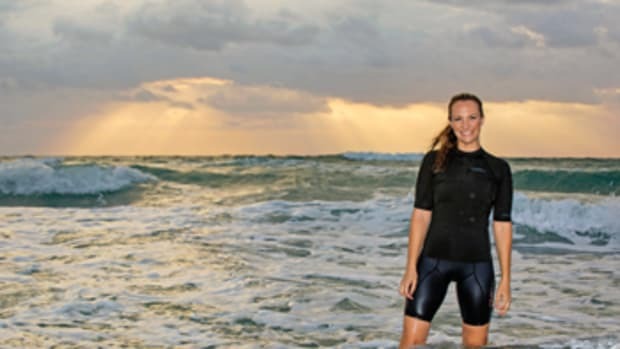 Harry, who was paralyzed in a car accident when he was a young man, has dedicated his life to helping people with brain and spinal cord injuries get back on the water. Shake-A-Leg was badly damaged in Hurricane Irma and needs our help now more than ever.